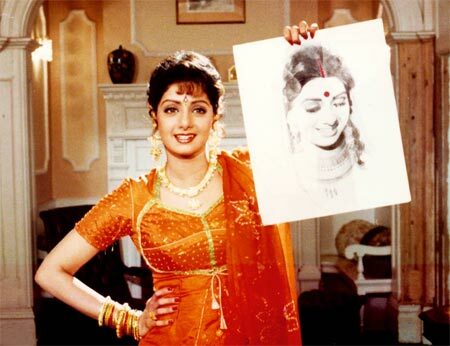 Rediff.com » Movies » YOUR Favourite Sridevi Avatar Onscreen? VOTE! One of the most versatile actresses of her time, Sridevi made her characters fun with her innate charm, innocence and screen presence. Aided with larger-than-life treatment and flambouyant outfits, some of her onscreen avatars became hugely popular. Word is, the actress will join the growing list of Bollywood stars at the Madame Tussauds museum next month, timed with the release of her comeback film English Vinglish. Which of her filmi avatars do you think she should be immortalised in? Take a look at her famous onscreen looks, and vote for your favourite! The water pots may have dominated most frames in Nainon mein sapna but it was Sridevi's bejewelled outfits and headgears that stole the show. Her onscreen shenanigans with costar Jeetendra became a huge hit. Sridevi sports a leather outfit in Himmatwala befitting her character Rekha, a shrew, who is tamed by Ravi (Jeetendra), the virtuous son of a disgraced village schoolteacher. The bubbly actress plays a mischievous village lass Radha, who falls in love with the new school teacher in this 1985 film. The actresses dresses up in a gold outfit to seduce her object of affection. Sridevi became the epitome of Indian male fantasy as she swayed passionately to her invisible lover's words in a blue chiffon sari. Seema pines for Mr India and professes her love with Kaate nahi katate during their rendezvous one rainy night. The actress transforms into a coquettish show girl as she crashes a party to secure information about a smuggler in Mr India. Ms Hawa Hawai left her fans short of breath in a golden dress, faux feathers and a headgear to boot. The revenge-seeking Rajni returned in Nigahen, the sequel of 1986 hit film Nagina. Dressed in a body-hugging golden suit, the shape-shifting snake fends off her enemies. The actress transformed into a mythical goddess in a white number in Chandni. Her white outfits fromt he film became popular as the 'Chandni look' back when the film released in 1989. Sridevi's twin portayals in the 1989 hit Chaalbaaz were the mainstay of the film. Manju's delightfully outrageous attire is in perfect sync with her fiery temperament. The actress transforms into her famous onscreen alter ego in over-the-top makeup and an outfit to match in the 1990 Dharmendra-starrer Nakabandi. Sridevi carried off western outfits as well as Indian wear with remarkable ease. In Lamhe, one of her most memorable films, the actress is seen in colourful Rajasthani clothes as Pallavi and chic pullovers in the later part of the movie as Pooja, Pallavi's daughter. The actress lent her trademark charm to Banjaran, a 1991 film, in a black glitzy outfit and a cutesy hairstyle. The actress puts a spin on an Afghan attir with faux fur and an elaborate headgear in 1992 film Khuda Gawah. She plays the fetching Benazir who is relentless in her quest for her husband who'd travelled to India to avenge her father's death. As a part-time crook on the lookout for her father's killer, Sridevi performs many a stage numbers in eye-catching outfits in Roop Ki Rani Choron Ka Raja. One of them has her holding knives as props, a sly reminder of her vengeful mission. Van Damme: I love to fight!